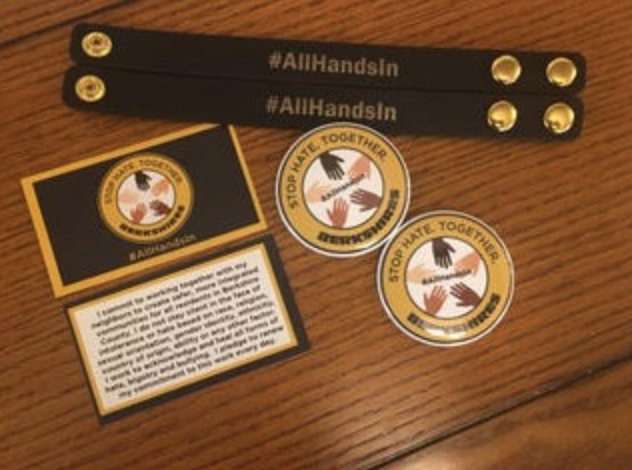 Students at Monument Mountain Regional High School in Berkshire County Massachusetts launched a Not In Our Town/All Hands In Pledge Campaign. Intent on inspiring greater engagement and awareness among their peers about inclusion and diversity, four high school student leaders partnered with local adults to kick off a Not In Our Town pledge campaign. Graphic developed for the All Hands In Berkshires Campaign. In December of last year, Monument Mountain Regional High School’s student activism club, Rise (of which we, Claudia Maurino and Lucy Doren, are two of the leaders), met with the founder of Multicultural BRIDGE, Gwendolyn Hampton-VanSant, to discuss ways in which Rise could partner with them in bringing awareness to the issues of racism and bigotry in the Berkshires and the MMRHS community. The Berkshires, in Western Massachusetts, often feels like a bubble: we feel protected from the “real” problems, and at the same time we —or those in power— can often turn a blind eye to the existence of issues such as racism in our very own community. This bubble is what motivated us to seek the beginning of a conversation. Just as Rise began to discuss ways we could do this, we found BRIDGE. They introduced us to Not In Our Town and the All Hands In movement. We loved the inclusivity of the movement: anyone could engage in the discussion or sign the pledge. It was a skill-nonspecific way to begin a much-needed dialogue. 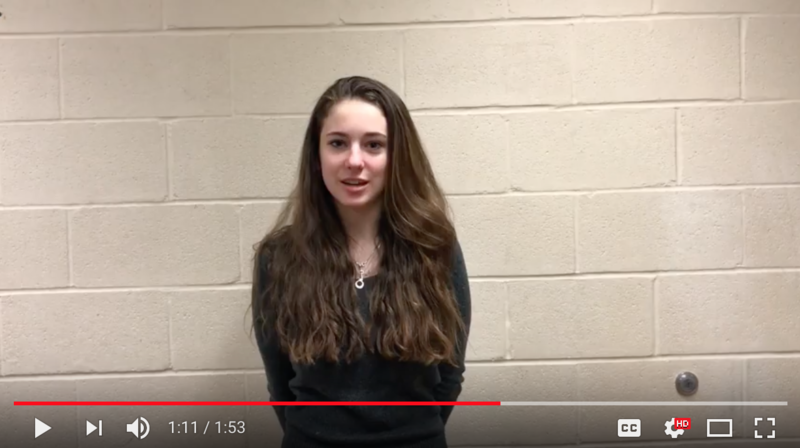 The informational video that students made and shared with the school. MMRHS’s principal, Amy Rex, has been supportive of Rise since the beginning. She wanted the initiative to reach as many people as possible, so she suggested we make a video highlighting the process and describing the importance of the movement. Before we could show the video, however, we had to inform the faculty and staff. Lucy Doren met with them at a faculty meeting one Tuesday and described what Rise was aiming to do. The teachers embraced the idea and supported us along every step of the way. One in particular, Michael Rosenthal, has been our faculty advisor and huge champion of all our endeavors this year. Following this, we created a two-minute informational video, which was then shown to the school during our homeroom period one Monday morning. During the week that followed, members of our club sat in the main hallway of our school distributing and collecting pledges. In this week we collected 125 signatures! The next Monday morning, we gathered all of the pledgers in the gymnasium for a group photo, which also served as a way for us all to come together. This offered some closure on the pledge process, but we see our work as far from done. In the future, we want to collect even more signatures. 125 is an excellent start, but in a school of 600+ (students and faculty), we know we didn’t reach everyone and there are definitely more people who could engage in discussion. Seeing so many of our peers gathered in one place to celebrate a pledge against bigotry was amazing. We feel that the pledge process is going to prove to be very beneficial. Even just for ourselves —separate from the community— we’re so happy to have gotten the chance to work with BRIDGE and begin to integrate the school community into the larger world. During the week that we were collecting pledges, we were really excited about all of the doors they would open and the opportunities that were to come. The next Monday, however, when we gathered everyone in the gymnasium, was an entirely different experience. Seeing so many of our peers gathered in one place to celebrate a pledge against bigotry was amazing. Not only did we feel accomplished, we also felt so grateful to have so many wonderful, caring friends and peers to be on this journey with us. None of that would have been possible without BRIDGE and the hardwork of people like BRIDGE staff that support MMRHS. Since last December, JV Hampton-VanSant works with our two years of 9th graders along with Stephanie Wright in building character and diversity leadership skills and they support youth voices being effectively heard and provide important education around justice issues. Rise is honored to get to work with the team to continue bringing new opportunities and change to the community. Materials created to support awareness and drive pledge signatures. Our connection with BRIDGE has had an extraordinarily positive and influential effect on our club and on the school community in general. 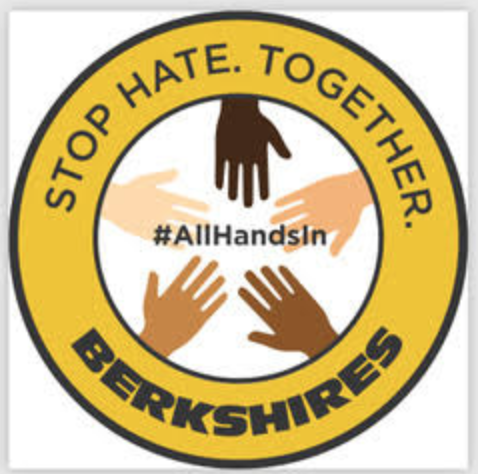 In addition to continuing our work with BRIDGE, we hope to form coalitions and partnerships with other local organizations —like the members of the Not in Our County -Berkshire Coalition aka AllHandsIn Committee— that strive to create the same kinds of change in collaboration. Rise’s largest goal is to create spaces and opportunities for conversation and action surrounding issues that are frequently glossed over. In April of this year, Rise is hosting a showing of the 2013 documentary, Girl Rising. Girl Rising tells the story of nine girls fighting for their right to an education in developing countries. We think education, awareness, and discussion are the cornerstones of any movement or enterprise. We want the pledges, the screening, and any other projects we undertake to lead towards a community environment in which policies and practices are questioned, ideals and issues discussed, freedom and fairness fought for, and all members equally supported, engaged, and uplifted. The Rise pledge campaign has inspired the students at Simon's Rock to "amp" up their outreach and engagement that had been started on campus. Additionally, the northern county groups combined in order to stage a unified response to racist incidents in the community through a Youth Forum in a Restorative Circle produced by a wide collaboration of Berkshires groups: AllHandsIn, BRIDGE Race Task Force, TRJ-South collaborated, Greylock Together, Northern Berkshire for Racial Justice and BRIDGE. Ultimately, student leadership has inspired a more cohesive county-wide response to hate and bias incidents in their wider community. Thanks to Gwendolyn Hampton-VanSant for her collaboration and developmental editing.